For works with similar titles, see Declaration of Independence. 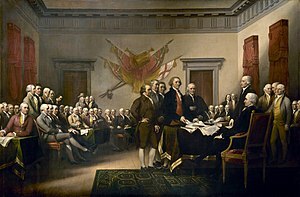 The United States Declaration of Independence is a statement adopted by the Second Continental Congress on July 4, 1776, announcing that the Thirteen Colonies then at war with Great Britain were no longer a part of the British Empire. Written primarily by Thomas Jefferson, the Declaration is a formal explanation of why Congress had voted on July 2 to declare independence from Great Britain, more than a year after the outbreak of the American Revolutionary War. The birthday of the United States of America—Independence Day—is celebrated on July 4, the day the wording of the Declaration was adopted by the Congress. Congress issued the Declaration in several forms. The first published version was a typeset broadside printed by John Dunlap, which only listed the names of John Hancock and Charles Thomson as signers. In 1777, Congress issued the Goddard Broadside, which listed all of the signers. What became the most famous version of the Declaration was a handwritten copy signed by the delegates, known as the engrossed version, which is on display in the National Archives in Washington, D.C. The Declaration of Independence is the first of the three Charters of Freedom along with the Constitution and the Bill of Rights. Draft of the Declaration of Independence by John Adams and Thomas Jefferson (1776). United States Declaration of Independence, broadside printed by John Dunlap (1776). United States Declaration of Independence, broadside printed by Mary Katherine Goddard (1776). United States Declaration of Independence, broadside printed by John Holt (1776) (transcription project). United States Declaration of Independence, broadside printed by Ezekiel Russell (1776) (transcription project). United States Declaration of Independence, copy engrossed on parchment by Timothy Matlack (1776). Declaration of Independence in United States Statutes at Large, Volume 1 (1845). Declaration of Independence used as a cryptographic key in The Beale Papers (1885). This page was last edited on 15 October 2018, at 12:59.